One of the ways that I love to use a bounty of fresh cucumbers is to make sweet cucumber relish. It is delicious on a hot dog or mixed in potato or egg salad. You know it’s summertime when the pickle making begins, and that’s what I’ve been doing for the past week or so. That and watering because we have had temps over 100 for about a week now. And cucumbers must have a constant supply of water to keep producing. 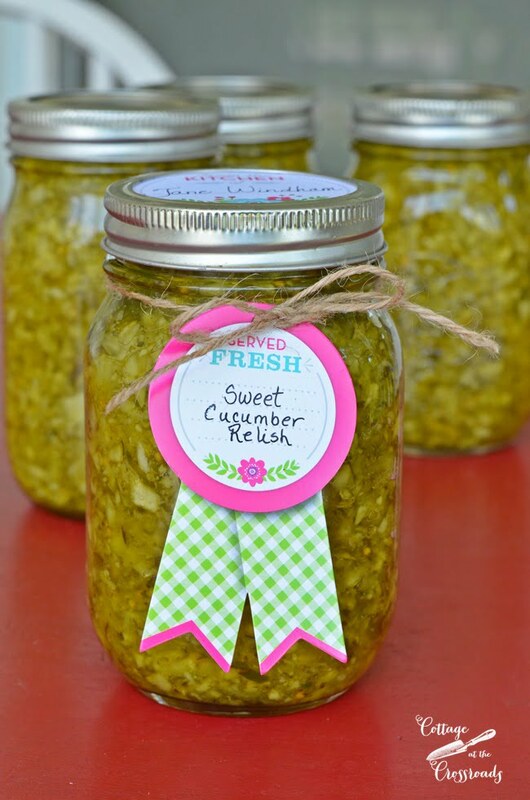 So today I’m sharing my sweet cucumber relish recipe that is the perfect condiment for those upcoming cookouts that you’ll be having or attending for the Fourth of July. This recipe could be made without processing with a water bath and stored in the refrigerator for a few weeks, but once you make homemade relish, you are going to want to have some to use later in the year. Because once you make this, you will never be able to go back to store-bought relish. To make this sweet cucumber relish, you will need about 8 to 10 small to medium sized pickling cucumbers. ( I have a lot of cucumbers in this photo because I double this recipe!) Wash the cucumbers and cut off the blossom and stem ends. 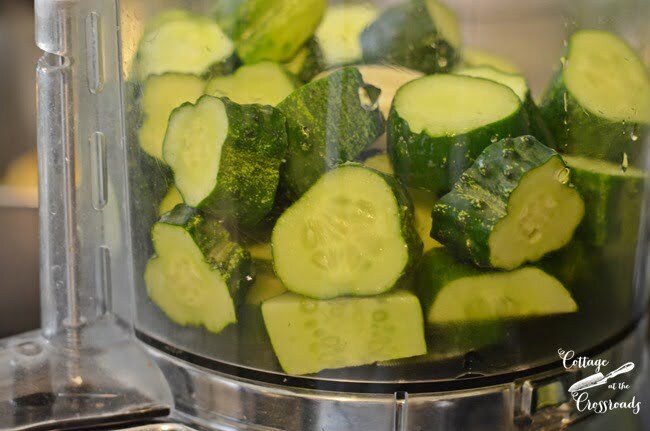 Cut the cucumbers into chunks and chop them in a food processor, being careful not to over-process them. 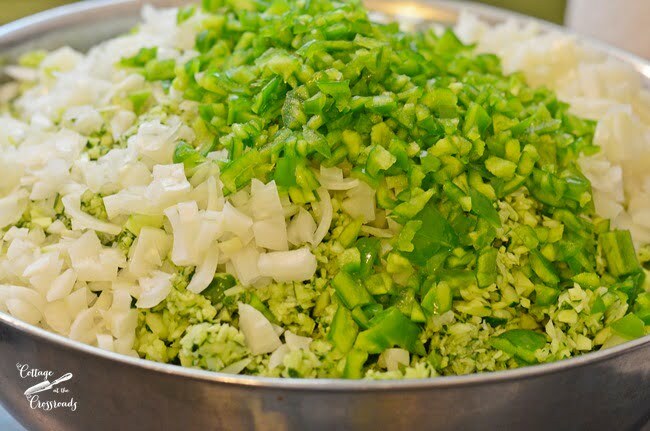 Wash, seed, and chop 3 large green peppers into small pieces and do the same to about 5 medium sweet onions. Combine all the chopped vegetables in a large bowl and sprinkle them with 1/2 cup pickling salt. Stir the mixture to evenly distribute the salt and add enough cold water to cover the vegetables. Cover and allow to stand at room temperature for 2 hours. Transfer the mixture to a colander set in the sink, rinse with cold water and allow to drain. Meanwhile, combine 3 cups sugar and 2 cups cider vinegar in a heavy stainless steel or nonstick pot. Bring to a boil, stirring until the sugar dissolves. Add 1 tablespoon mustard seeds, 2 teaspoons celery seeds, and 1 teaspoon ground turmeric to the vinegar solution along with the chopped vegetables. Return to boiling then reduce heat and simmer, uncovered, for about 10 minutes, stirring occasionally. Ladle the hot relish into hot, sterilized pint jars, leaving a 1/2 inch headspace. Wipe jar rims and add lids and screw bands. At this point, you can store the jars of relish in the refrigerator after the jars have cooled and use the relish within a few weeks. But to truly preserve the fresh taste of summer, I process the jars using a water-bath method for 10 minutes. This relish is the perfect balance between sweet and tangy and tastes superb on hot dogs and brats! It also is a great addition to potato or egg salad. 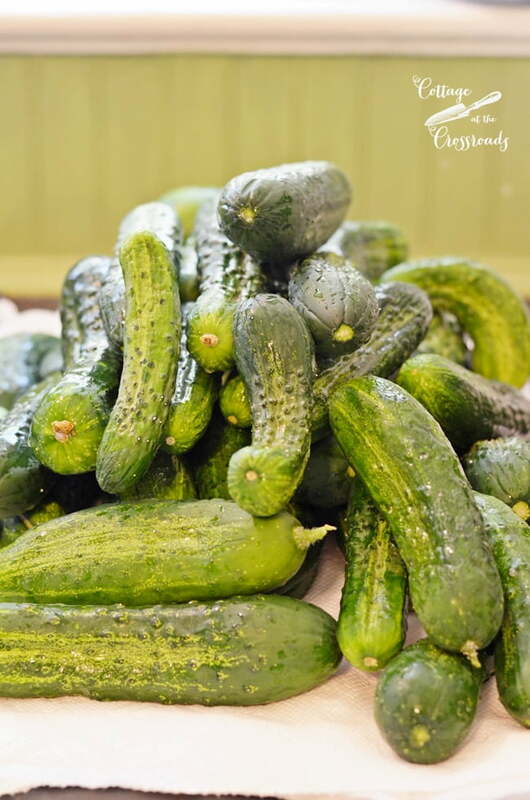 If you don’t have a garden, get some pickling cucumbers from your local farmer’s market and try this recipe. Make some for yourself and your friends and family. If you don’t process your jars, be sure to tell them to store the relish in the refrigerator and use within a few weeks. But if you process the jars, the relish will last for at least a year in the pantry. Here’s the printable version of the recipe, and if you’re looking for more canning recipes, just click HERE. A delicious sweet and tangy relish that tastes great on hot dogs and in potato salad. Combines chopped cucumbers, onions, and peppers in a large bowl. Sprinkle with pickling salt and stir to distribute the salt throughout the mixture. Cover and allow to stand for 2 hours at room temperature. Transfer vegetables to a colander set in the sink. Rinse with cold water and allow to drain. In a large stainless-steel or nonsitck pot, combine sugar and vinegar. Heat to boiling, stirring until the sugar dissolves. Add the mustard seeds, celery seeds, and turmeric to the solution along with the chopped vegetables. Return to boiling, reduce heat, and simmer for 10 minutes, stirring occasionally. 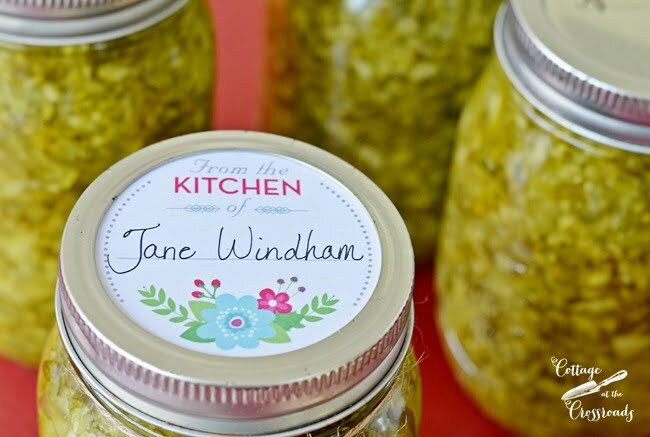 Ladle the hot relish into hot, sterilized canning jars, leafing a 1/2 inch headspace. Wipe the rims, add the lids and screw bands. Process the filled jars in a boiling-water canner for 10 minutes. Remove the jars from the canner, place on a dry towel, and allow to cool overnight. If you do not want to process the relish, store the jars in the refrigerator after they have cooled and use within a few weeks. I just got a batch ready to sit for 2 hours. I also make cucumber jelly and i put the cucumbers through my juicer for that. The pulp that is left over i put in with the chopped vegetables and looks like it will work well. No waste!! I will let you know how it works. This recipe sounds great! My mom and I are going to start this recipe this week and was just wondering if you could tell me about how many jars this recipe makes? Thank you in advance!! We can’t wait to start! I believe I was able to get 7 pints. Linda, I have never tried this recipe using celery so I cannot advise you on this. Hi there! Your recipe sounds wonderful. Would you use your relish to make tartar sauce? That’s my main concern as I am going through several relish recipes–it must make good tartar sauce! ???? Yes! I use this relish to make my own homemade tartar sauce. Good luck with your canning! Oh yes! This is an easy recipe. 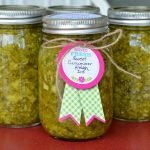 You can’t mess it up and once you make the relish, you’ll never want to buy it at the store again! What can I do to thicken up my relish it’s a bit runny. Diane, I wouldn’t do anything to thicken the relish. I would go ahead and can it as is. When you get ready to use it, you can remove it from the jar with a slotted spoon or drain it. 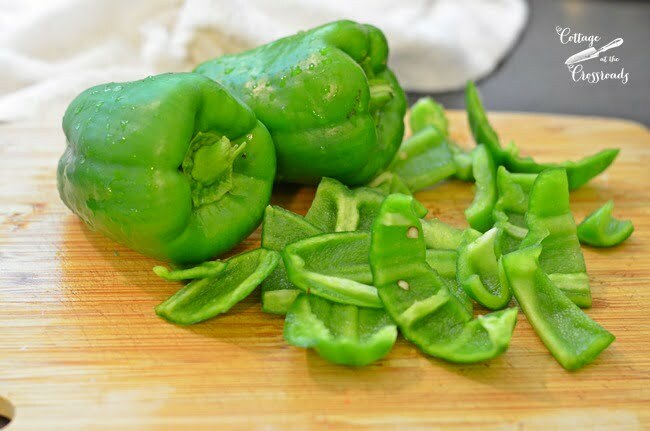 Is the quantity of 3 large green peppers for a single batch or the double batch that you made? Theresa, my peppers from the garden tend to be on the small size so I use 3 small ones for the single recipe. If you are using large peppers, you may just want to use 2. To add some color to your relish, you could use one green and one red one. I was always curious how to get the cucumbers down to a small enough size like they do in the grocery store – looks like I’m going to have to go and buy a food processor if I want them to be proper! 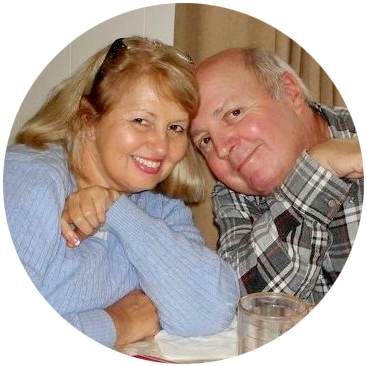 Thank you for sharing your recipe, super excited to start making my own relish at home! This really looks delicious. My mouth is watering. Thank you for the recipe. So impressed with the taste of this recipe I am finishing up our third batch. Have given several of the pints away so had to replenish our supply. Thank you so much for coming back to the blog and leaving your feedback about the recipe. I am delighted to hear that you’ve really enjoyed it! 7 of what, half pints, pints? Thanks for the recipe Jane. I make a ‘pickled squash’ using small yellow squash cut thinly, vidalia onions, chopped green and red pepper and follow the same principle as your relish. Even the same amount of sugar, vinegar & spices. We love it with pinto beans and corn bread 🙂 I know your relish is going to be just as great! Thanks again! 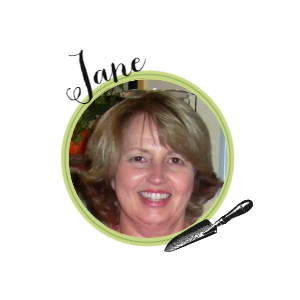 Looks so wonderful Jane….love relish and can’t imagine how great your homemade relish is!…Thanks for the recipe! 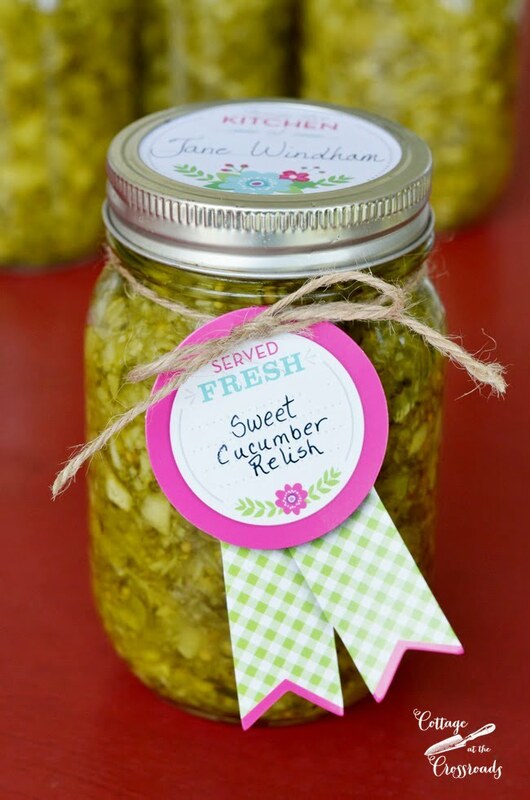 Sounds yummy Jane, I love pickles….hubby hates them so I never make relish or pickles. I wonder if I could use stevia in this recipe, sugar is one of my new food allergies 🙁 Love the pile of cuke pic. I have never made anything like this but it sounds so good. Cukes are in season locally so now is the time. Thanks for the recipe! AnnMarie, this recipe would be a good place to start to learning all about preserving your own food. Make it the first time to enjoy now, and then once you get your feet wet, explore more about the canning process.